White Diamond is perfect and I love her and my hype for this is going at 200mph I need a break to breathe. Oh my splendid ruler, you look quite vibrant today. Might you make me part of the collective? The background is boss. And I love the details. Her expression is the best part. Oh my gosh! This is just-- this is just so amazing!! I am gonna cry and remove my eyeballs because there is nothing else worth looking after this keep up the amazing work! You're art has been promoted to the White-Diamond-FC group profile picture! I know like same???!!! I saw the teaser for her and I was like "YES FINALLY!!!!!!!!!!!!!!" This is so freaking pretty! White looks so perfect, and I love the expression on her face! She looks so bored and over it, and the background framing her is just AHHHHHH YES! It's so pretty!!! She looks so beautiful and evil and I'm just freaking out!!! I love this! This piece is one for the Favorites! Stellar job on this piece! Keep up the incredible work! Oh dear thank you so much! I'm very happy you like it. Its beautiful but, my eyes hurt just staring at it. OUCH! Makes one think right? What the heck is this monster???? SHE'S A GOD AMONG GEM-KIND!!! Everything is so beneath her thousands of years of gems suffering is nothing more than a lil scare for big momma diamond. 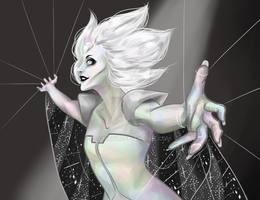 Looks amazing, White Diamond my favorite of the Diamonds, awesome and the most intimidating/threatening, the most powerful, and more scarier than Yellow Diamond, love it . Thank you! She really is something. Gives you the jibbies. Love how you drew her! I'm glad you do thank you so much! What if she's not even a gem? Did you see her form in the episode? Maybe she could be some kinda sentient outer space supercomputer or something! OoOOoOo that would be so cool! LOL would certainly make all those Glados memes accurate comparisons. Why didn't she have a gem in the episode though. How curious is that? I know! She looked like a statue, it was super creepy too. I have a feeling that's not her real body. I learned that Sugar drew her with a gem similar to pinks, Though that makes me wonder if her appearance was pre-recorded and that's why she didn't respond to steven. I THINK SHE HAD HER GEM it was just much too bright to see. I darkened a screen cap i took of that close up and i saw a weird shadow near her brow, check it out! Remember the episode Reunited, when the crystal gems fought Blue diamond? 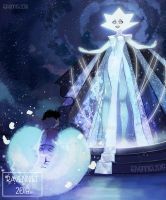 If Blue and Yellow diamond was so strong, I wonder how much invincible White Diamond is. 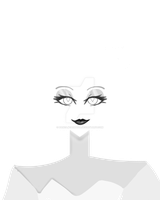 White Diamond looks like the Queen of gems, or even worse: the goddess of gems. description betwen "??" are just theoric. Healing the feelings of the gems. Destabilize the feeliings of the gems. Destabilize the physical form of the gems.
? Manipolate mind and physical form of the gems?
? Force field (An Giant and enchanted version of the bubble shield) ?
? Starlight Nova (an explosion of light extremly too powerfull)? Interesting theory, can't wait to see if it turns out true!